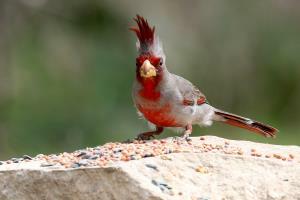 Watched this Pyrrhuloxia at the bird blind. Very windy which caused his crown to flutter! Temps in the low 70's, cloudy and windy. Fitness hike with friends along Roadrunner Trail at the South Shore. Not much to see, just a chance to hike and talk. Went to the bird blind and saw some birds (photo attached). Water and toilets available at the campground at the mid-way point.